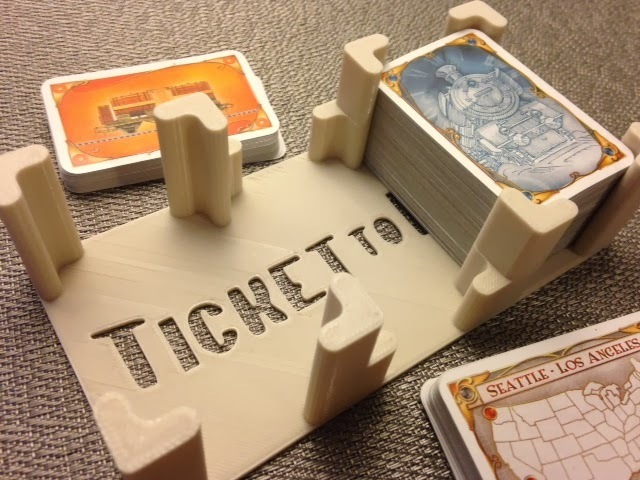 A couple of days ago on Day 120, we printed some train trays for the excellent game Ticket to Ride. That was all well and good until the cards seemed all out of order and falling out of their giant tall stacks. So we printed a card holder for train cards, ticket cards, and used train cards. The logo for the game was put in the bottom with Tinkercad and Inkscape using the method outlined in Steps 4-6 on Day 109, with a picture from the internet as the starting point. Settings: MakerWare .3mm/low on a Replicator 2 using the MakerBot "warm gray" filament that I seem to use for everything these days. Stuff to change later: I forgot to put little bridges to attach the insides of the letters o, R, and d. Next time!